Aaron Ramsey is the latest Arsenal star to a cause a stir by letting his contract run into its final year. Both Mesut Ozil and Alexis Sanchez did the same last season. Sanchez eventually left, while Ozil penned a new deal. 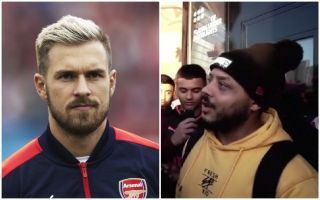 At this stage it seems that Ramsey is more likely to follow Sanchez’s example, with the Daily Mail claiming he is on course to leave the Gunners on a free transfer next summer. Football fans care about loyalty and commitment. With that in mind, AFTV regular Troopz has called on Unai Emery to stop playing Ramsey. Furthermore, Troopz believes Arsenal already have a capable replacement in Alex Iwobi, who came off the bench for Ramsey in Saturday’s 2-0 win over Watford. Ramsey has been at Arsenal since 2008 when he signed from Cardiff City. He has scored more than 50 goals for the Gunners and lifted the FA Cup three times.